A heavily built, blue bird with a chestnut back, this roller is usually seen hunched on a commanding lookout perch in a tree, on a post, or on a telephone wire. It watches for large insects on the ground, suddenly exposing its long, broad wings as it swoops to seize them, then returns to the perch. Insects are also caught in midair. In the breeding season, the displaying male flies high in the air and performs steep ascents followed by wild, twisting dives that show off his wing colors. The display is accompanied by croaking and rattling calls. Breeding pairs defend territories, but flocks form before migration. 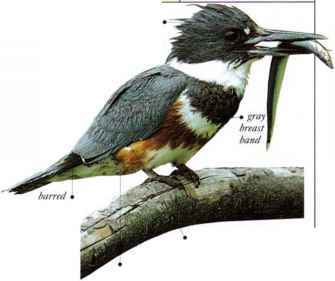 • NEST An unlined caVity in a tree, or exceptionally in a bank or cliff. • Distribution Breeds in parts of Europe and n. Africa. Winters as far south as South Africa.